Using pay rates is optional. Each employee can be set up with a default pay rate and/or multiple pay rates per position. This dollar and cents amount can be used to calculate approximate cost on some schedule views (ex. Statistics view) by multiplying this field by hours scheduled. Only managers with permission can see employee pay rates. 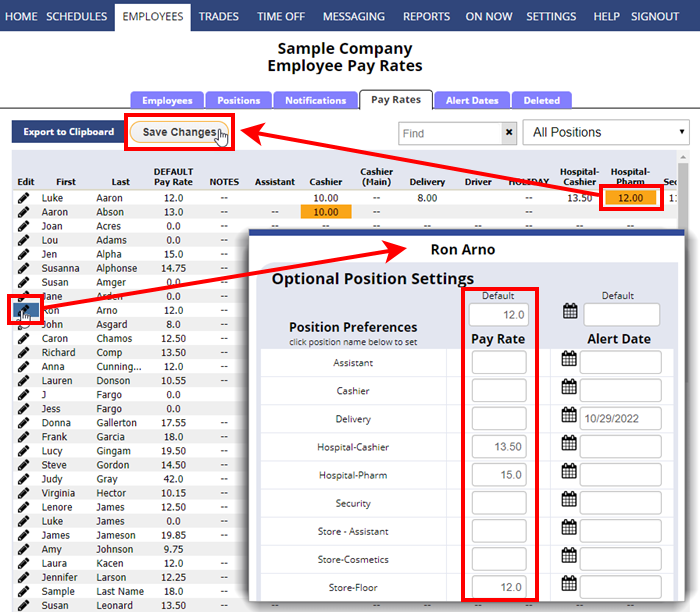 Only the Main Manager can add Managers and set whether each can see pay rates. Employees cannot see their own or anyone else’s pay rate. You can set the first column “DEFAULT PAY RATE” for each employee by clicking in that field.